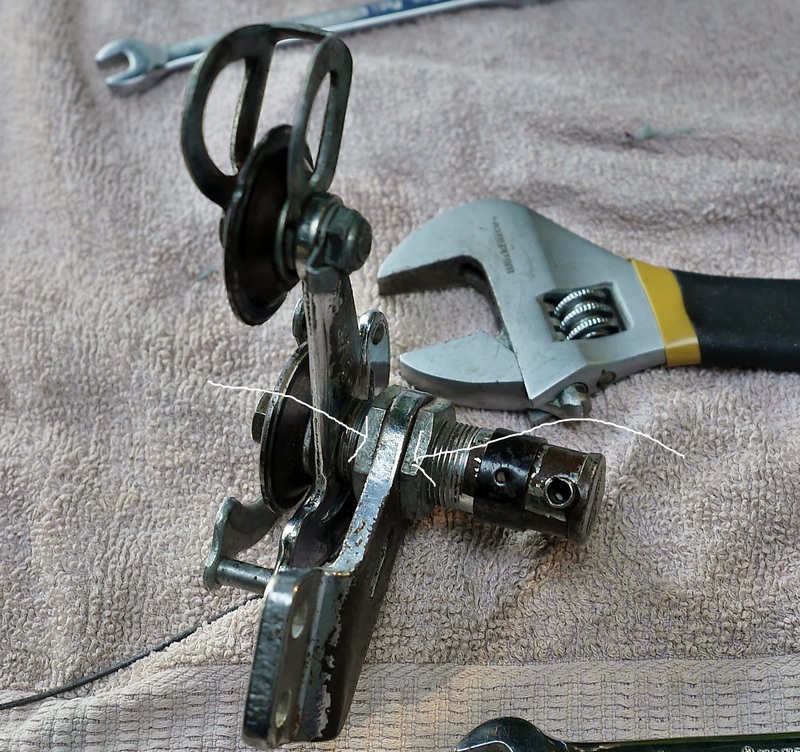 Sadly, I missed my calling as an engineer (I am a CPA in my day job), so I had to research the question of what advantage a bellcrank mechanism would have over a simple direct pull with a cable on the device that moves the derailleur cage. Fortunately Wikipedia, and of course, Sheldon Brown came to the rescue. 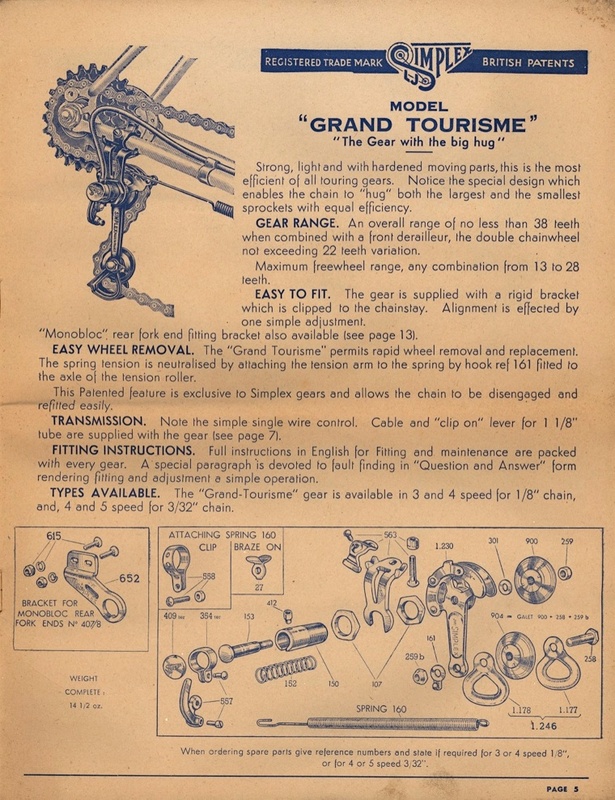 The Rigidex was one of several models to use a bellcrank, and was the lower end version of the Grand Tourisme model. 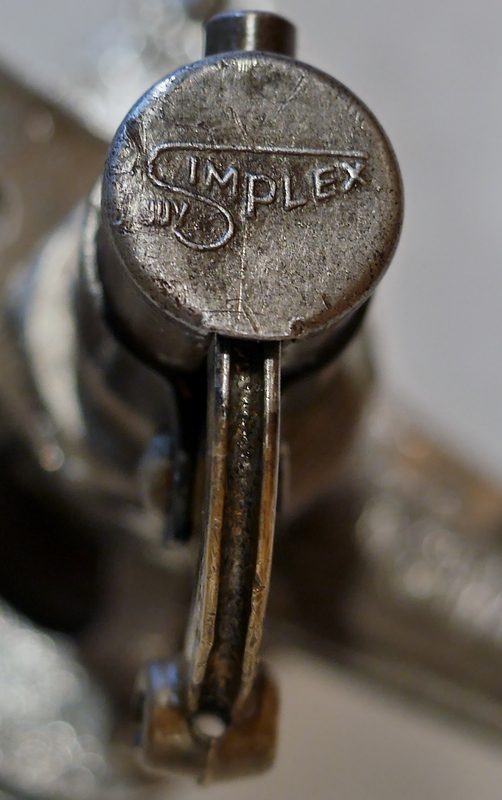 Other bellcrank models included the Lux and Gran Prix. You can see from the catalog scan above that the shifter cable lies inside the curve of the bell crank, and is anchored below with a screw. 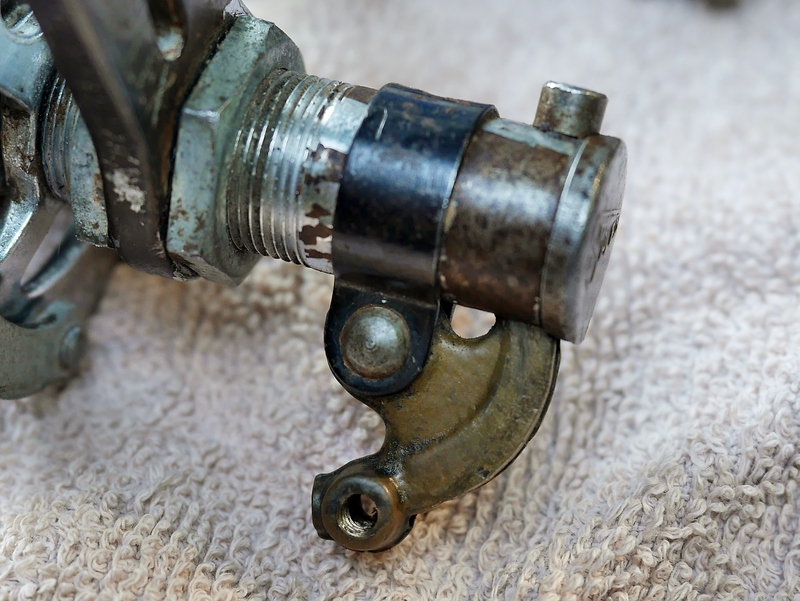 When the shifter cable is engaged, the bellcrank mechanism moves against a pushrod/plunger that is housed inside the cylinder, and it pushes the pulley cage inward toward the wheel hub, moving the chain across the freewheel sprockets. Since it pushes, instead of pulls, that means that it is a “high normal” derailleur. At rest, the derailleur lands on the smallest rear cog. Simplex TDF and Record Du Monde derailleurs are “low normal”, with the pull-chain pulling on the coil/plunger to bring the cage away from the freewheel. Interestingly, the Cyclo Standard and Tourist model derailleurs have a dual action shifter, which is never at rest, as there is always the same amount of tension on the shifter regardless of which position it is in, a result of its dual cables (or single cable wrapped around the shifter) which actuate a helicoid to move the cage. So, I guess you can say that the Cyclo is a “no normal” derailleur. Mimicking the effect of limit screws on modern derailleurs, the above nuts (identified with white arrows), can be loosened to allow re-positioning of the mounting bracket, so that the derailleur can shift properly over the particular freewheel installed on the wheel. This derailleur has a cage swing capacity for 4 speeds. 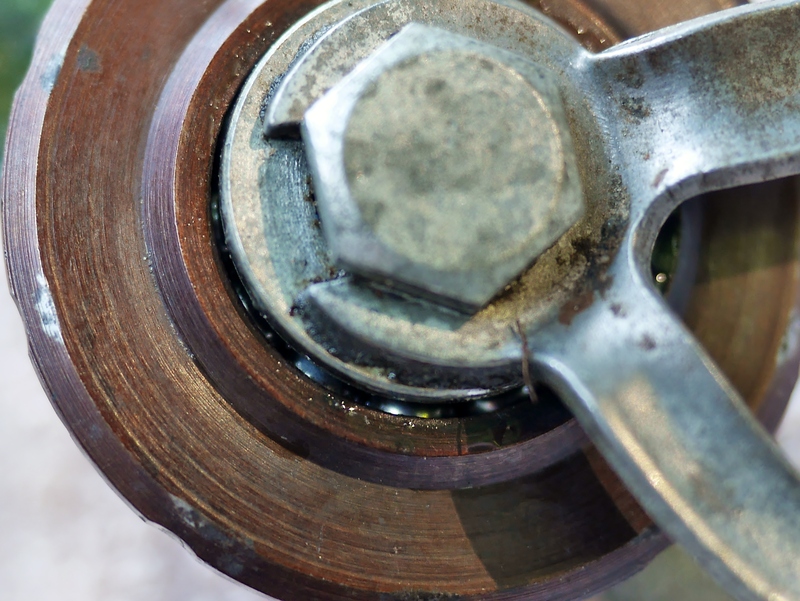 So, this isn’t really a true limit screw adjustment, instead it’s a hub/freewheel adjustment. 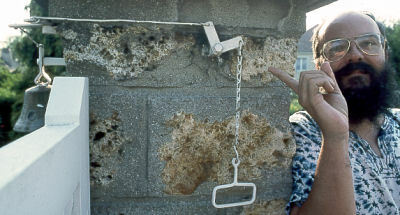 While there are two springs used for this model, only one of them affects the chain slack. The mounting bracket is rigid, so there’s no arm which can swing under tension. 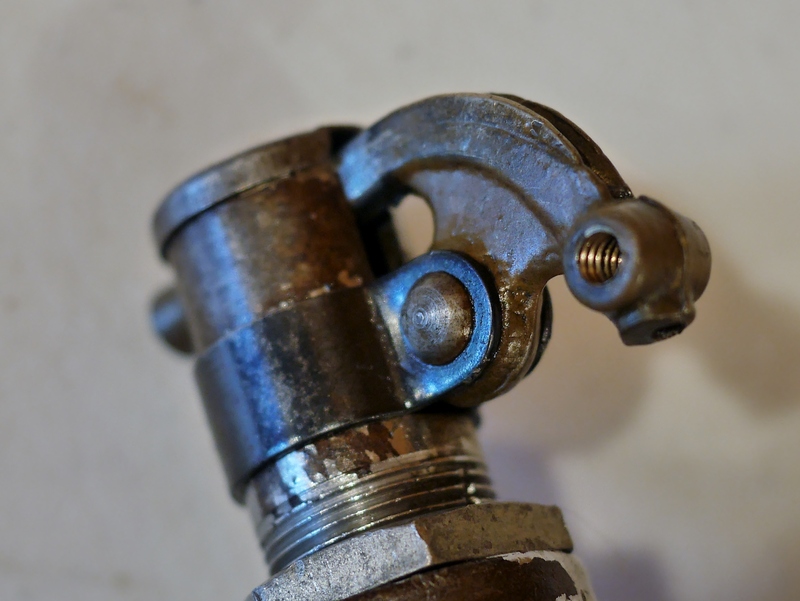 Instead the larger outer spring is attached to a braze-on on the frame, and serves to act as the tension on the jockey (upper) pulley. The smaller inner spring keeps tension on the plunger/pushrod, allowing it to return back to its resting position when the cable is slack. This contrasts with Simplex’ TDF and Champion du Monde pull chain derailleurs, which offer swing arm tension as well as pulley tension. Even though Nivex came out with its far superior parallelogram rear derailleur back in 1938, the breakthrough was slow to catch on, so that even in the 50’s and 60’s many derailleurs lacked the greater shifting effectiveness provided by the transversing arms of a parallelogram. Even so, having ridden bikes equipped with these old derailleurs, I have found that they work surprisingly well when properly set up. 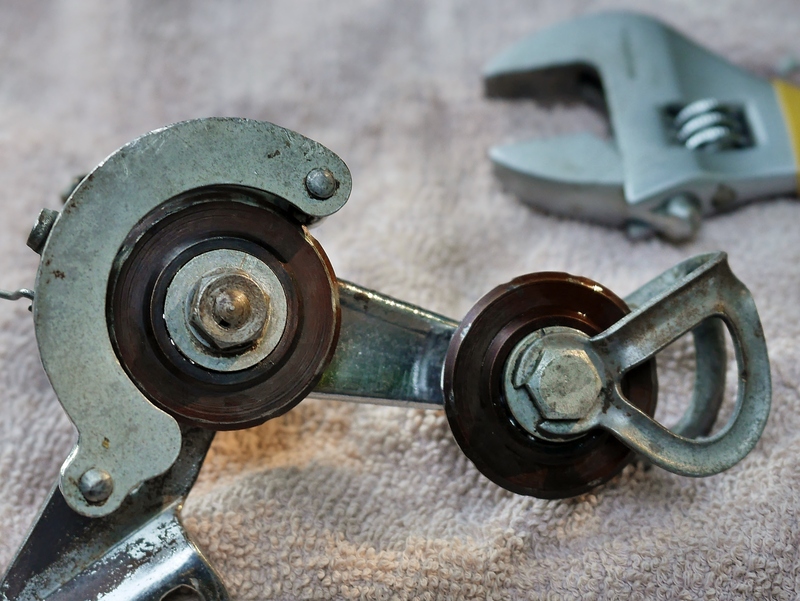 Pulleys feature ball bearings – a nice touch. Chain must be broken to be removed – unlike the TDF and Record du Monde models. 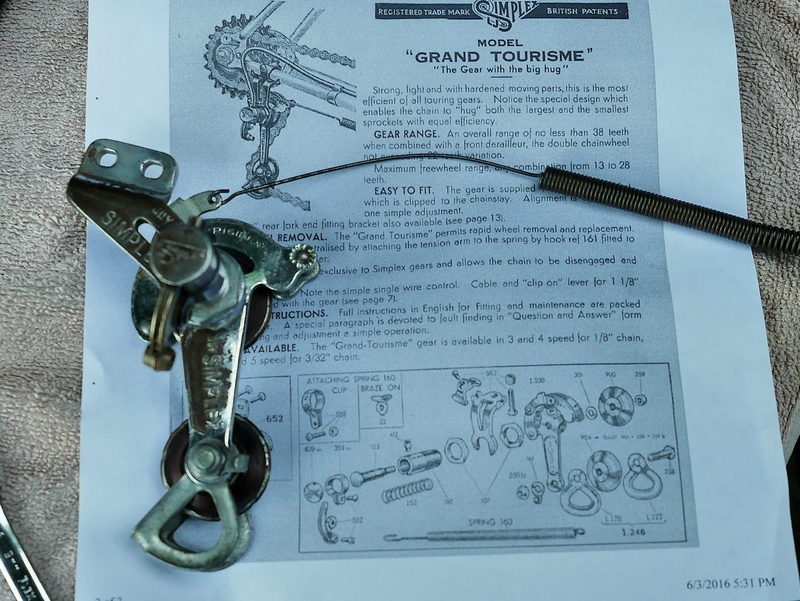 I had originally thought that this derailleur allowed the chain to be removed intact, as is the case with the Simplex TDF and Record du Monde models which feature open pulleys at the back of the cage. That’s not the case for this derailleur. A nice feature, even on this lower end derailleur, are the ball bearings inside each pulley, instead of bushings. So, what benefit does the bellcrank offer? As I learned from my research, a bellcrank increases the mechanical advantage of a linkage, because the angle of the arms changes as the bellcrank is actuated. Bellcranks are actually still used in bicycle applications, though not as elegantly as this one. You can find them on Shimano internal gear hubs, among other applications. Sheldon Brown had fun illustrating the mechanical advantage of a bellcrank by featuring a bell which is rung by a bellcrank! Is this mechanical advantage really needed for a rear derailleur system? It may have been helpful on high normal models which pushed the derailleur toward the hub. 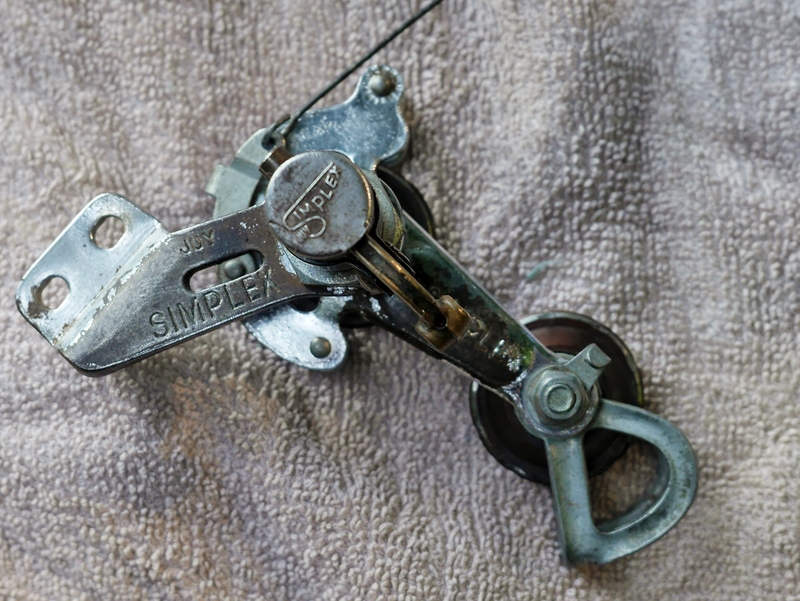 It will be interesting to try this derailleur out on the road, but their application is limited to bikes with brazed on fittings, or by using special brackets which are now difficult to find. 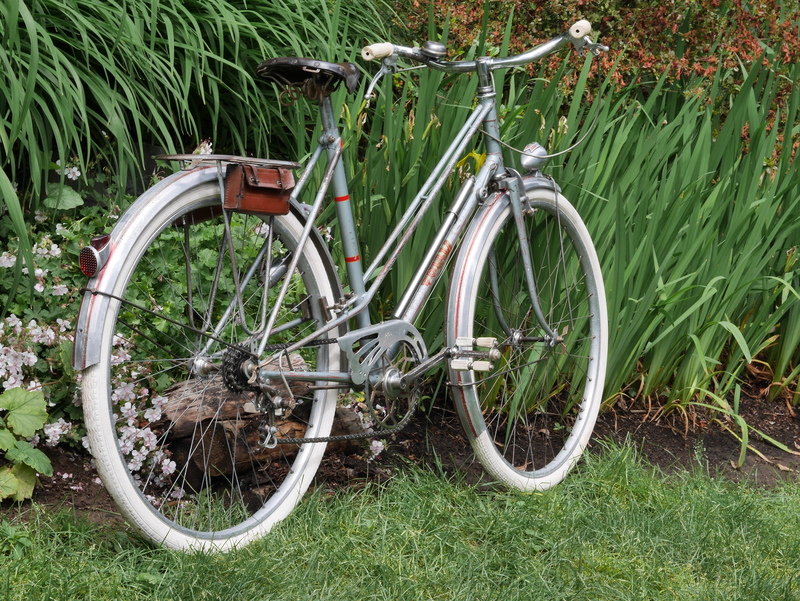 This entry was posted in Bicycle restoration, Simplex derailleur, Vintage bicycle restoration, Vintage French Bicycle and tagged bellcrank, Cyclo Derailleur, Simplex Grand Toursime, Simplex Rigida by Nola Wilken. Bookmark the permalink. Hello, great write up on these derailleurs. These derailleurs work nicely on the road in my experience. I have one on my Oscar Egg Randonneur bike which I ride at least a couple of times a week. The Simplex Rigidex shifts quickly smoothly and predictably. Better than I expected from a 1930’s design. 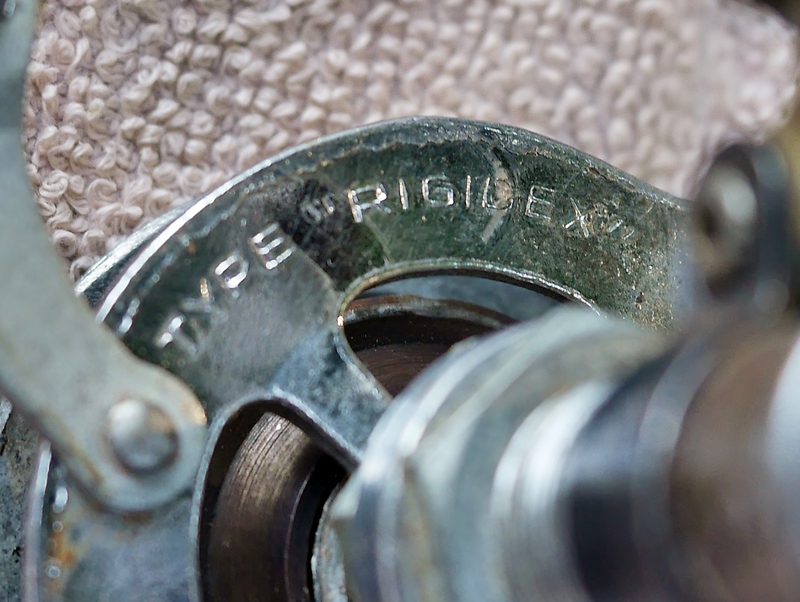 Hi Reid, thanks for sharing your experience with the Rigidex. Glad to hear you are riding your Oscar Egg! I have found that the Simplex pull chain models also shift quite well when set up correctly.